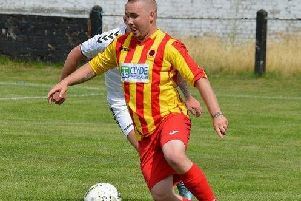 Rob Roy eventually overcame a stubborn, ten man Kilbirnie side to collect three valuable points from their opening game of 2019. And the Kirkintilloch side’s 4-0 win made it a satisfying 300th match, as player or manager, for Rabs boss Stewart Maxwell. It was the Rabs who went on the early attack with skipper Joe Slattery’s netbound shot blocked for a corner. Kilbirnie hit back with Kyle Rafferty testing the Roy keeper Willie Muir with a long-range effort. Rob Roy kept up the pressure on the Ayrshire side with Lee Gallacher sending over a dangerous cross that was only parried by keeper Joe Wilton as far as Jordan Currie-McLean, who saw his shot blocked. Then Michael Daly missed a Gallacher corner when free in front of goal and Willie Sawyers’ angular shot was taken high by Wilton. Ladeside came close in the 19th minute when, from a Rafferty corner, David Anderson’s header just cleared the bar. Rob Roy then suffered an injury blow when Fabio Capuano retired with a calf strain to be replaced by Gavin Mackie. Slattery tested Wilton from 25 yards, then at the other end Muir did well to make a save with his feet before Kieran Wood’s follow up was flagged for offside. In the final minute of the first half Graeme Ramage’s 20-yard free kick lacked power and was easily dealt with by Wilton, bringing to an end a rather lacklustre opening 45 minutes. The second half was only four minutes old when Reon Juskowiak handled a Sawyers header in the box, picking up his second yellow card and giving referee Birch an easy decision in flashing the red card at the Ladeside defender and awarding a penalty kick. Gallacher stepped up and sent the spot kick low past Wilton to give the Roy the lead. In the 55th minute the Blasties should have equalised when James Finlay broke through on goal but could only fire against Muir. In a much improved second half Currie-McLean shot over the bar, Gallacher’s cross was inches too high for Sawyers and then Ramage managed to blast over when only a few yards out in front of goal. 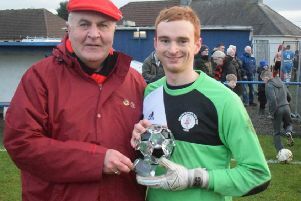 At the other end Muir, who was named Rabs man of the match, was showing a safe pair of hands when called into action. In the 72nd minute Currie-McLean’s effort was pushed wide by Wilton as the Roy continued to press for a further goal. After a period of scrappy play and with the visitors showing signs of fatigue the breakthrough came with eight minutes remaining when Gallacher’s pinpoint cross to the far post was nodded in to the net from close range by substitute Connor Hughes. He then returned the compliment in the 85th minute by crossing for Gallacher to shoot low past Wilton. In the final minute Hughes added number four when he neatly finished a clever move between Gallacher and Mackie. Overall it was a score line that flattered Rob Roy but nevertheless a welcome victory and a pleasing clean sheet, for only the second time this season.